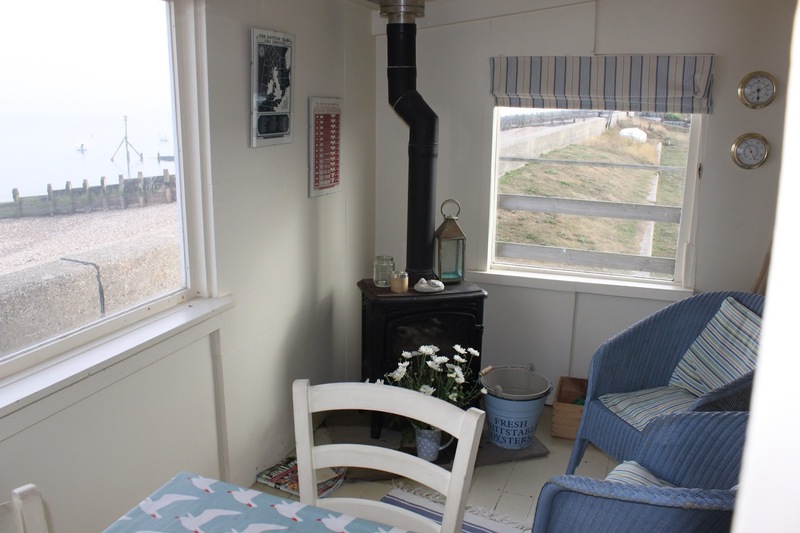 Would you like to see where we stayed in Selsey? It was a very special place so mind your head as you join us! This was the view from the window- we couldn't get much closer to the sea, unless we camped on the beach! We only had one meal out, on the first night, as nothing could beat this view! But the view and close proximity to the beach is not the best part of our accommodation. It has two very special and unusual features. Isn't it just fantastic? I found it on the internet and instantly fell in love with it! I have been looking forward to our holiday here since February. I thought of the carriage's former life on the London Brighton and South Coast railway line, maybe taking excited families down to the sea side for the day. It is a fitting way for them to spend their retirement, don't you think? The beach wall was quite busy with beach users, dog walkers, ramblers, cyclists and runners going by. It was amazing how many looked or stopped at the sight of the carriages through the window, and also stopped for a chat. My brother and sister-in-law came down to spend the day with us too and thought it was an amazing place to stay. It was nice to have such a good time with them, as they too have had a difficult year. As I have mentioned in my previous railway carriage post after the 1st World War, railways were being amalgamated and there were many carriages surplus to requirements. 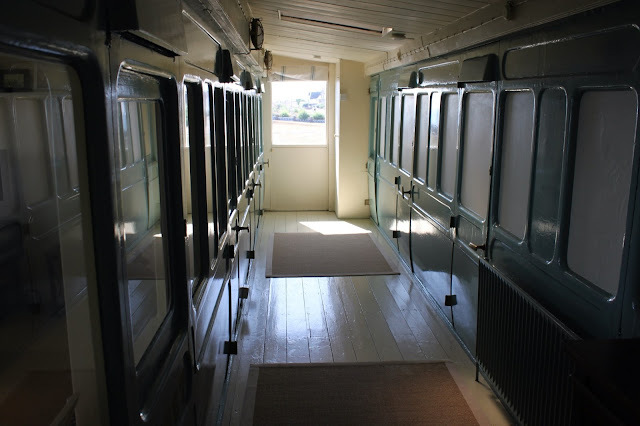 At the same time there was a shortage of houses and the carriages were often given to soldiers to live in. 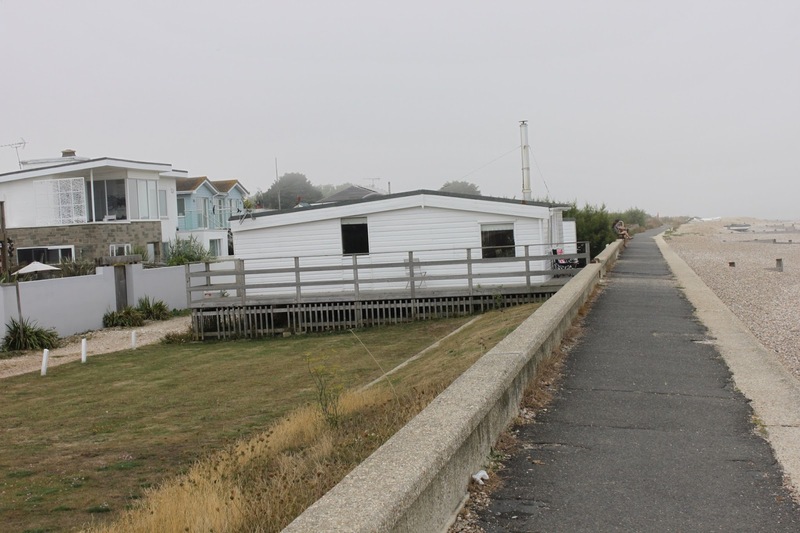 We were amazed how many houses we saw in Selsey that had been converted from railway carriages. We had fun spotting them all week and must have counted about 20 - above is just a small section! Sir Patrick Moore the famous astronomer, broadcaster and author, who sadly died this year, lived in Selsey. The night sky there was so clear I wish I knew the name of all the stars. The second was Eric Coates, this view towards Bognor so inspired him that in 1930 he wrote " By the sleepy lagoon". This became the BBC's well-known signature tune for "Desert island Discs"
We didn't need a desert island, we found our paradise here at Seabank! Since returning home autumn seems have arrived too, there has been quite a nip in the air in the early mornings. This weekend we have had an enjoyable time visiting 3 Eco homes which have been opened under the Heritage open days , did anyone else visit any interesting buildings this weekend? We saw many great ideas and were given lots of advice on how to live more substantially, which has given us food for thought. Oh Wow!! That is brilliant!! Ooh Sarah it looks so nice, we did sleep also in a train in Australia, I think it was in Undara with some lava caves. But the train were you sleeps looks much nicer than were we were. I love your accommodation it looks so lovely. Have a nice week Sarah. Thanks for showing the wonderful train. Greetings Petra. What a fun place to stay. We have a restaurant in town called The Sidecar which is an old train, but I have never seen a place to actually stay. The decor is so cute and the view tremendous. Oh Wow! what an amazing place. I will ear mark Selsey as a must visit place and maybe even stay. Thank you so much for your inspirational posting. I must get around to blogging about Bosham. Beautiful images of what must have been a wonderful and relaxing vacation to enjoy not only the gorgeous surroundings but also the very very special accomodation you stayed in. I had never heard of anything like it but it looks so cosy. I had never thought the houses you're showing were all converted railway carriages. O, and it must be great to stay so very close to the sea. Absolutely wonderful! If you look on the link to Seabank there was no mention of dogs. As I had fallen in love with it, and was desperate to stay I emailed them to ask if they would accept a small well-behaved dog and luckily they said yes. I will try this with other properties in the future, as they can only say no! Ooh Sarah, I'm so envious, how fabulous, you lucky thing, you! I love the bluey green colour of the first class carriage, amazing! What a fascinating post. I love the idea of staying in the railway car. Your views were incredible and how cozy is that car for relaxing in the evening! I think that looks like a terrific place to stay. I did not realised staying in a railway carriage could be so comfortable! The rooms, the seating area....it all looks perfect! Happy to hear you had a good time! so cute.. i love the way it's been decorated! it must have been lovely so close to the water. What a fun place to stay, such a great idea. I bet nothing could beat your dining room view. It is no wonder that you had such a relaxed and wonderful time. The railway carriage looks idyllic as does the spot where it lives - gorgeous. Wow that's fantastic, and I'm green with envy. What wonderful views from your carriage. I love it and am going to Google this right now. Thanks for sharing this Sarah and love your stunning photos. Have a good week. What a beautiful place to stay Sarah, thanks so much for sharing these pictures with us-the place is picture perfect. What a brilliant idea too. Oh Sarah, what a stunning place, the view is amazing and the carriage is stunning, simply stunning! I imagine you felt completely relaxed just reading and gazing out to sea. Lovely photos as always! Wow, I'd love to stay in one of those. They look very confortable and cosy and the views are fantastic. What a beautiful and creative place to stay. I love all your pictures. I feel like I just got a little vacation too! Oh Sarah - what a wonderful retreat. I've only been to Selsey the once, but spent many a Summer a little further along at the Witterings and Hayling Island. A place I could fall in love with too. I too used to visit Elspeth,I was so shocked when I heard she had dies. She was so inspirational and I still re -read her posts too. It's absolutely beautiful, and what a lovely spot to stay in. Wonderful. Glad you had such a good time.